We support our customers and their requirements with several core products for removable insulation. Whether it is architectural fit-out project or industrial plant we helped contractors from various sectors in designing, manufacturing and supplying customised flexible insulation covers. Our main insulation products are listed below. Our SoundStop Pad C is a dedicated, non-combustible product for suspended ceilings that enhances the ceilings acoustic performance. It consists of glass or mineral wool matt encapsulated in glass-fibre or e-glass fabric. SoundStop Pad C helps to reduce airborne noise and due to tight encapsulation it provides rigid seal that stops flow of fibres in the air. 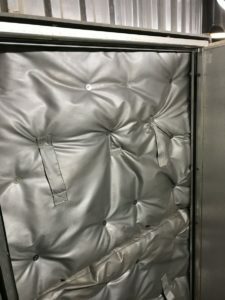 Material used for fabrication of this acoustic insulation pads is fire rated. Internal part of the pad can be filled in with any specific acoustic insulation material of your choice. Our ceiling insulation pads can be fabricated to any shape you desire. 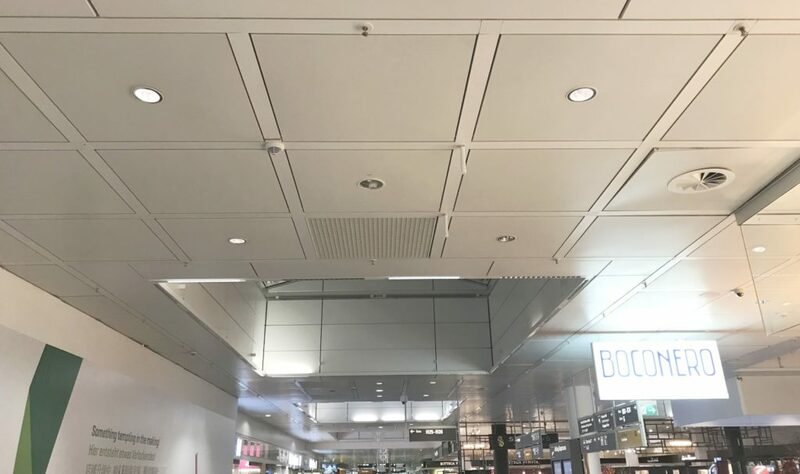 It can be prepared either to a square tile to fit on top of most of the standard ceiling grids or it can be fabricated to circular, triangular, trapezoidal, half-moon, curved, etc. 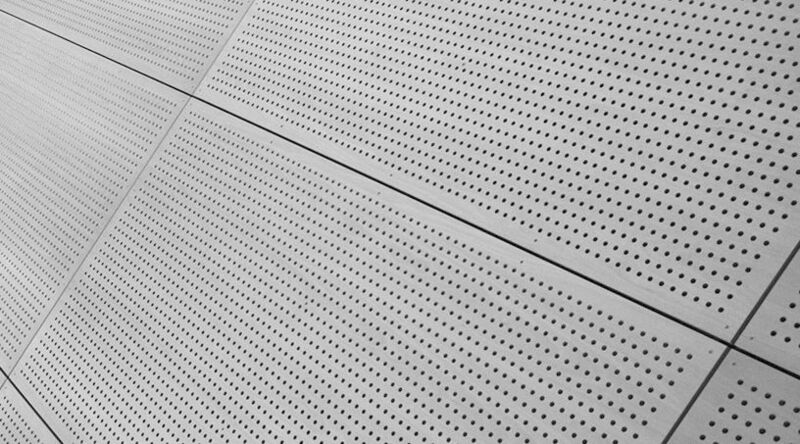 When installed on top of the perforated acoustic ceiling these pads can be partially visible. With standard range of colours the acoustic insulation pad can be selected to match the suspended ceiling colour or to be in contract with the ceiling colour. Furthermore, we are able to accommodate any cut-outs for lighting, speakers, fire or smoke detectors or anything else fixed within the suspended ceiling grid. Our ceiling insulation pads can fit any manufacturers systems, like Armstrong, SAS or Lindner. Would you like to learn more about our SoundStop Pad C – read our post about the benefits of using our ceiling insulation pads and contact us through the form below. SoundStop Pad W is very similar to our ceiling insulation pad. This product, however, is dedicated to wall acoustic cladding systems. Due to installation in vertical position it can be manufactured with additional fixings provisions – either with metal rings for screws, hooks or pins or with straps or other type of fixings. Depending on the size of the cladding panels our SoundStop Pad W can cover the surface in full or be divided into smaller pieces. Thickness and density of the insulation material can be customised to suit the acoustic design. Quite frequently our valve removable insulation jackets are used on industrial facilities like power plants, energy from waste plants, petrochemical plants. 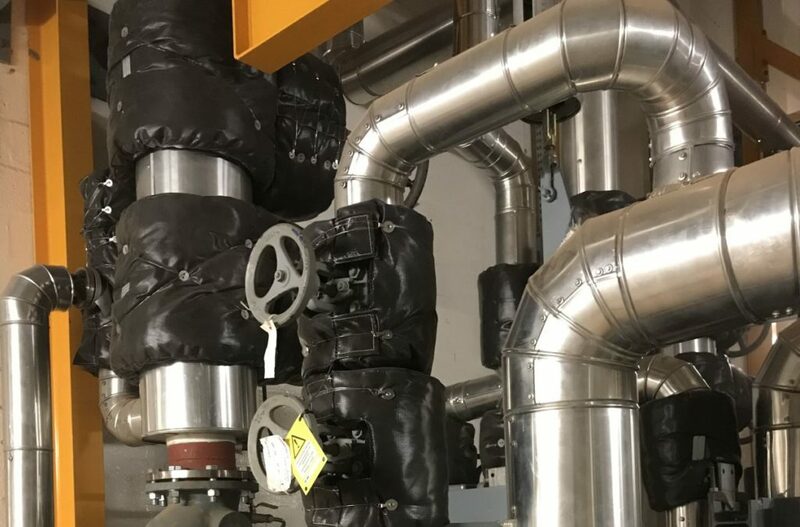 Mechanical equipment can consist of different types of valves and our valve mats a bespoke solution to fit into the specific location in between insulation covered with metal sheets. Removable insulation jackets for valves can be from a single part or multiple items to allow for accommodating any fittings, pipes, flanges or handles. If you are a plant owner or operator than the Valve mat should be your preferred solution for valve insulation. It helps you save maintenance costs and speeds up removal and re-installation of insulation for valves. Read our post on how we manage production of valve insulation jackets here. Industrial facilities like power plants are often furnished with numerous manholes and access hatches within the boiler, FGT, filters, hoppers, air or flue gas ducts. In order to stop the excessive heat loss through manholes we produce removable insulation covers that fit into the openings and serve as thermal insulation. These removable mattresses are also manufactured to specific sizes. With temperature resistance up to 1200°C our removable insulation covers for manholes and access hatches can be used in most demanding industrial environments. Would you like to learn more about any of our products? We will be happy to support you. Please contact us through the form below.